Between October and Easter - so the rule of thumb - it's time for winter tyres. We recommend the timely purchase of winter tyres. Then you have enough time to get detailed information about the products - and there are thousands. The size of the tyre is most important - it must be approved for the vehicle and is listed in its documents. There are a few good reasons for new winter or all-season tyres: New cars often have summer tyres - a breakdown or worn tyres with a tread depth of only a few millimetres are two more reasons. The latter is not only dangerous, but may even cause a fine. Therefore check the condition of the tyres regularly. They are not durable endlessly. 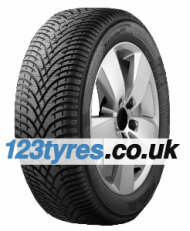 We do not only offer you great UK deals on winter tyres, but the right kinds of tyres for every occasion as well. If you drive less, you should take a look at the DOT code on the sidewall - it reveals the tyre's production date. After eight years the rubber compound is so decayed that the tyre should be replaced, even if its tread is still ok. Before buying test reports help judging the quality of a tyre. Experiences of other motorists can also be used, as they are based on the everyday stresses and challenges. What about the driving comfort and the performance in wet conditions? These are important criteria for your tyre order at 123tyres.co.uk. We make sure that these tyres live up to your expectations and perform as they should to keep you safe on the road. No matter what car you drive, you will find the right kinds of winter and all-season tyres here.